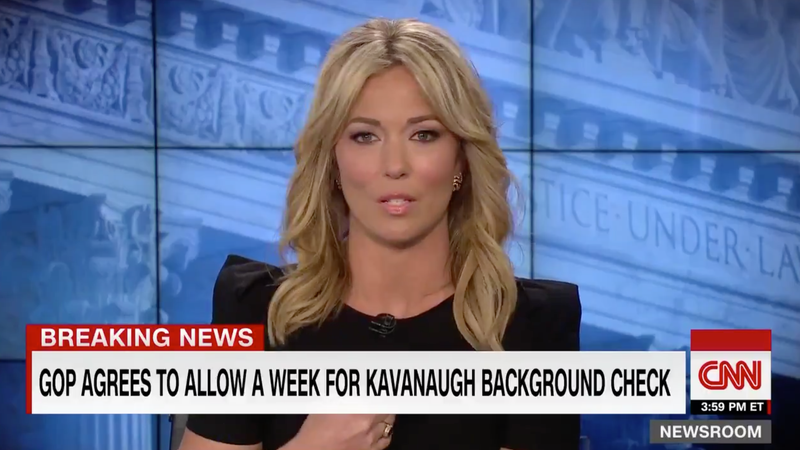 CNN Newsroom’s Brooke Baldwin ended her Friday afternoon program with a monologue, giving voice to survivors of sexual assault sharing their truth in the wake of Christine Blasey Ford’s testimony against Brett Kavanaugh. Ford’s testimony moved millions of Americans and brought untold numbers of survivors out of the shadows. Baldwin spoke of a young woman in her office sharing her own story after Ford’s hearing. C-SPAN’s talk line was flooded with stories from sexual assault survivors, including a 76-year-old woman whose story of being molested as a second grader went viral. This morning, 23-year-old Maria Gallagher said she had never told anyone about her sexual assault until she ambushed Senator Jeff Flake in an elevator, potentially prompting Flake to call for a more thorough investigation into Ford’s claims against Kavanaugh.